If you own a dog with seemingly endless energy, you probably need to find ways to keep your furry friend active throughout the day. When you don’t, your pooch may “invent” their own fun “activities” out of your shoes, books, furniture, or anything else they can possibly chew on. While a quick run or time in the dog park may help alleviate some of your dog’s energy, rainy weather limits your options dramatically. 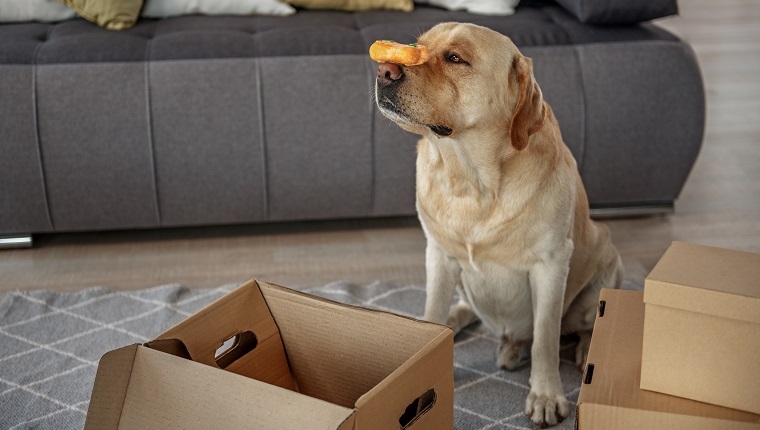 Now that spring is here and April is bringing its showers, your pup could probably use some fun indoor activities to fight the boredom. April is also Active Dog Month, so it’s a great time to form good habits, no matter what the weather is like. Fortunately, there a few things you can do inside on a rainy day that may keep your dog mentally and physically in shape–and hopefully out of trouble! With all of the commands, running around, and strange positions necessary to get the perfect shot, taking some funny photos can be a great way for you and your dog to both get tired out. And even kids can get in on the fun! You may want to try staging your dog doing something human, like typing on a keyboard, or wearing a pair of glasses and looking at old text books. 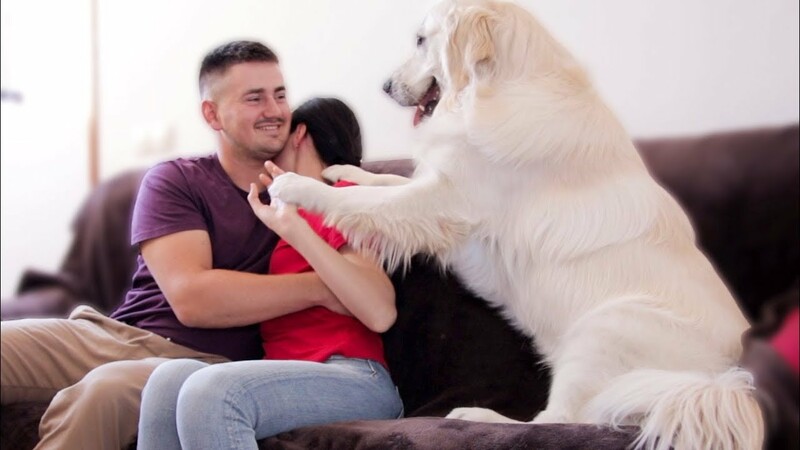 Humans love when dogs do people stuff! Just make sure to keep the photo session short enough to hold your dog’s attention, reward them for a good job, and don’t go overboard with the props. If your dog doesn’t like dressing up or posing for pics, don’t force them. 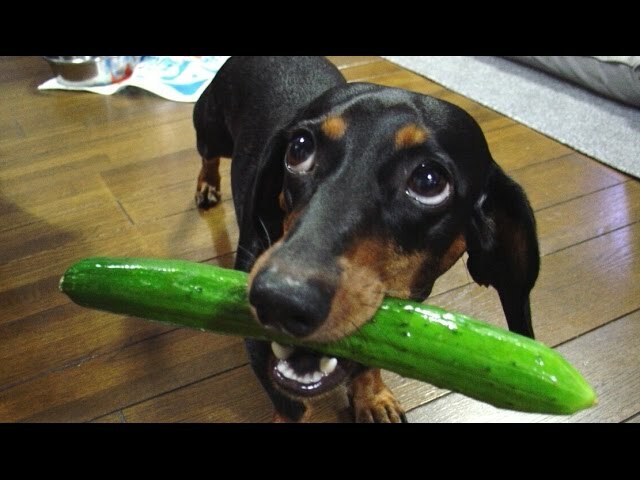 There are several food-dispensing toys dogs adore–or at least love what’s inside, but that’s what counts, right? Products like the classic Kong are great not only for rainy days, but whenever your dog is getting antsy or hyper and you need a quick distraction. Simply throw some food inside, and let your dog roll, gnaw, and bob it all around the room until they get tired or there is nothing left inside. Kong isn’t the only name in town, either. Try searching for puzzle feeders that your dog might like to try. There’s a huge variety out there for dogs of all sizes and jaw strengths. With dog obesity becoming a major, growing health issue, please remember to administer treats and snacks responsibly. If you have kids, dog bowling can be a great activity to involve them in, too. First, gather as many empty two-liter plastic bottles and milk jugs as you can—these will be the “pins.” Then, go into a long hallway or other area of your home where there’s enough room for your dog to run. Stand all the pins at the end of the room in a bowling-alley triangular formation. Finally, grab a tennis “bowling” ball and roll it toward the pins. If your dog likes to chase, they will probably go flying after the ball and knock over the pins. Set them back up and see who can get the most strikes. Of course, some dogs might not like the pins or the noises they make, so pay attention to your dog. Don’t make them uncomfortable. 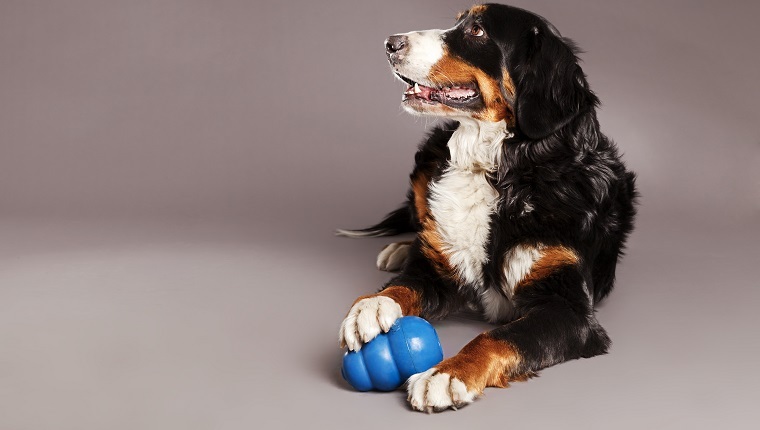 You can still play a nice game of indoor fetch without pins if that’s what your dog prefers. Dogs get more than physical exercise when they’re outside—they get mental exercise, too. Working on training can be a great way to help keep them mentally active, even if they’re stuck inside. 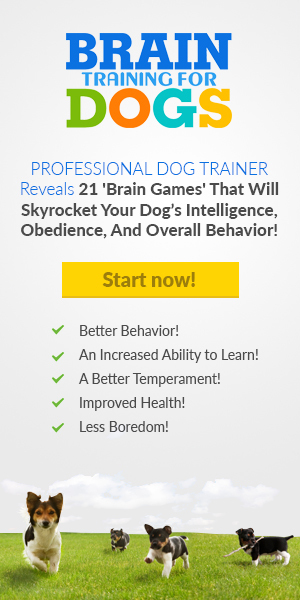 Whether you are teaching a puppy to sit, or just brushing up on some commands, if you push your dog’s abilities, they will probably get tired out pretty quickly. Just make sure to keep training sessions at an appropriate length of time. Don’t train so long that your dog grows bored, and make sure to let them rest so they can retain what they’ve learned. Some dogs seem to be absolutely waterproof, so don’t let a little rain scare you from taking them out. If they’re still full of energy after the first four suggested activities, maybe it’s time to throw on a raincoat (or not) and head outside. Whether it’s a quick walk along your normal route, or putting on some boots for puddle jumping, they may have an amazing time splashing in the great outdoors. However, the time you spend cleaning them up after going outside may be less than amazing. And if your dog absolutely can’t stand getting wet in the rain, don’t force them. 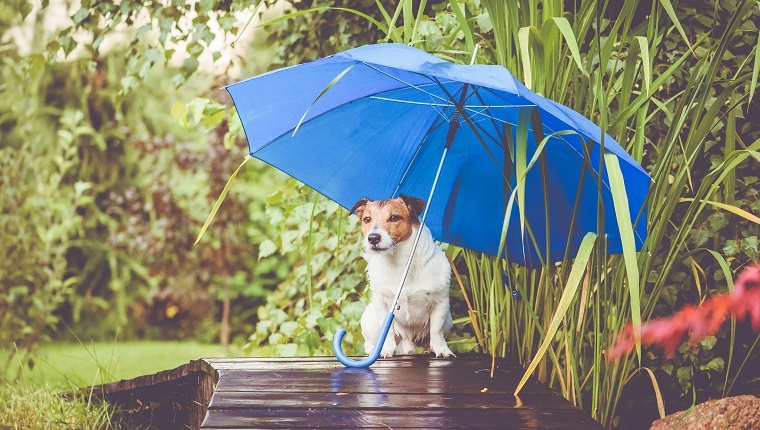 Don’t let a little rain stop you and your dog from getting active. From canine bowling and puddle jumping to funny photos and food dispensing toys, there are plenty of things you can do to get your dog some mental and physical exercise, no matter what the weather is like outside. What other fun activities do you do with your dog on a rainy day? How does your dog stay active indoors? Let us know in the comments below!